I’ve heard of Leigh Bardugo’s Grisha Trilogy but I’ve seen mixed reviews of it so I’ve always been hesitant about picking it up. Especially now that we’re so close to the end of the year, I feel like sticking to books that come highly recommended. So when my good friends Angie and Michelle started raving about Six of Crows, I paid attention. If they both loved it then I knew chances were high that I would enjoy reading it too. And I wasn’t disappointed. Words of wisdom from Kaz Brekker, ladies and gentlemen. It was just a pleasure to see all six of them working together, doing their best to trust and rely on each other. Even if they don’t always know what’s going to happen next. Even though they know each person in their group has done things he/she is not proud of. Each of them had their limits stretched during the time they’re all together. Their adventure kept me absorbed because the action never let up. I had no way of predicting how things will turn out and how these characters react to the situations they found themselves in. I was rooting so hard for them to get the prize that they all deserve. I also enjoyed the worldbuilding in this one. I was a little confused by the different kinds of powers the Grisha had (Six of Crows is my introduction to the world) but I became more familiar with them as the story progressed. Based on the descriptions, I think Ravka is based on Russia while Fjerda is probably one of the Scandinavian countries. 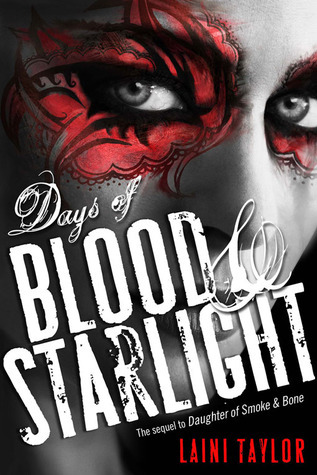 I was also a fan of Leigh Bardugo’s writing in this one. I felt like the story just flowed smoothly, and there were lines from the characters that I kept highlighting. Last but certainly not the least, there’s more than one slow burn romance in Six of Crows with flawed characters that totally deserve to be together even if they don’t realize it yet. I can’t wait to see how these romances develop, especially the one which is the most subtle out of all of them. It must be noted that the story is not fully finished in this novel, and there will be a next installment due to be released next year. I was mildly surprised to reach the end, partly because I wanted to keep reading, and also because I wanted to know how the story ends. The second book can’t come soon enough. 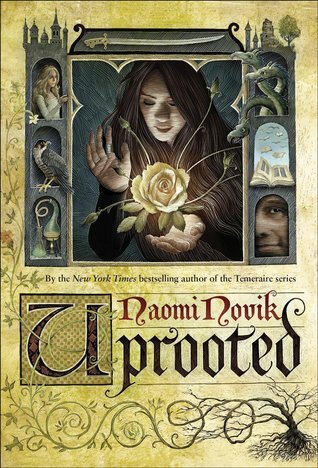 I have been curious about Naomi Novik’s standalone fantasy, Uprooted, ever since I first heard about it. I read the first few Temeraire books and thought they were well-written. I just didn’t feel like continuing with the rest of the series. 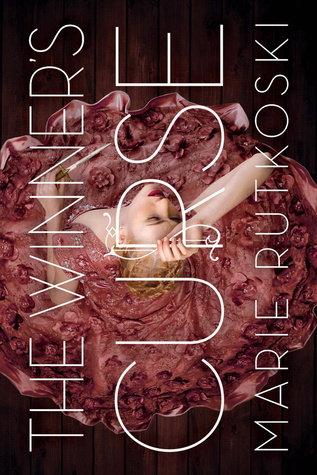 Closer to Uprooted’s release date, I saw glowing reviews pop up in the blogosphere and that just made me want to read the book even more. I picked it up when I was in the mood for a good fantasy novel – Uprooted delivered and even went beyond my expectations. It’s one of my favorite reads this year. I love how Uprooted’s first line just drew me in. Right away, I wanted to know more about Agnieszka and her village’s arrangement with the Dragon (who is a wizard and not a mythical beast). I really liked Agnieszka’s character. She had a lot of freedom because she was a Dragon girl and was able to run wild as a young girl. She used to think that one of her greatest skills was that she could always be counted on to mess up her appearance, getting her clothes torn and having mud stick to her skirts. But I think what’s great about her is that she cares deeply about people, especially her family and her best friend Kasia. I knew this was a significant trait that would shape her actions for the rest of the novel. At the start of the book, she has no idea why the Dragon chooses her and was as surprised as anyone else to discover that she is actually capable of doing magic. It was interesting to see her grow and develop her skills as a witch, more so because she has a different way of doing magic. I found her interactions with the Dragon entertaining! Some of the scenes were surprisingly funny for me. The Dragon was so ill-tempered, arrogant and a little vain. He was very reluctant to be a teacher to Agnieszka, he only did it because he felt it was his duty to train anyone who has magical abilities. He was snooty and kept looking down at Agnieszka when she couldn’t manage the simplest forms of magic. He thought she was a hopeless case. He strongly reminded me of Diana Wynne Jones’ Howl from Howl’s Moving Castle, which is not a bad thing because I loved that book. I just wish there was more about the Dragon, I wanted to know more about his backstory and I also wanted him to have more scenes in the latter half of the book. I was also pleasantly surprised by how much I liked Kasia. I thought she would have a small role to play in the story but she has an inner strength that’s very different from Agnieszka’s. I loved how solid their friendship was because I always enjoy reading about strong friendships in fiction. I loved the fairytale feel of the writing. It reminded me of some of my favorite authors like Robin McKinley, Juliet Marillier and Diana Wynne Jones (because of the Howl-like character). I thought the first half of the book had great pacing. I was very absorbed and wanted to ignore everything else so I can keep reading. The pace slowed down a bit after reaching the halfway mark, but it picked up again for the last few chapters. I enjoyed reading about the world that Naomi Novik created, from the mysterious and horrifying Wood to how magic works in different ways. Agnieszka’s magic is more instinctive and closely tied to nature and her environment. While the kind of magic that the Dragon wields is a more traditional (in their world), more scientific, with specific steps that need to be followed in order for a spell to be executed well. I also liked the experimental feel of the two kinds of magic being combined, I thought that was described beautifully. It felt like the combined magic worked specifically because it was Agnieszka and the Dragon doing them. Even though I wanted to read more about this world, I’m very satisfied that Uprooted is a standalone novel. Nowadays when so many series books are being released, it’s refreshing to read a book that is complete on its own. Beautifully written, Uprooted has everything that I love in a good fantasy novel: solid worldbuilding, political intrigue, strong heroine, friendships and family ties, and a romance that has a bit of a love-hate flavor. 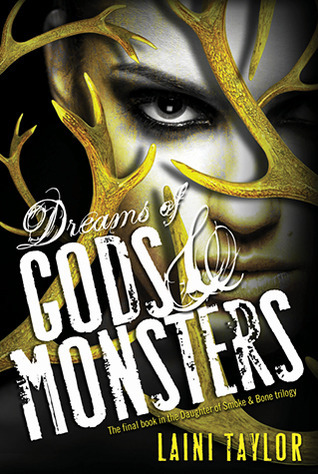 Highly recommended for fantasy fans. I felt like I was reading an old favorite when I picked this up. I’m pretty sure it’s a book that I will be rereading in the future. I’m keeping my fingers crossed that Naomi Novik will write a companion novel set in this world with cameos from Agnieszka and the Dragon! I’ve also heard the news that the rights for an Uprooted movie adaptation have been bought and I’m really hoping they’d do a good job with that. I had high hopes for this one since it kept being recommended by bloggers I trust. Also, they said that it’s a good read for fans of Megan Whalen Turner. In my eyes, that’s the highest praise that they can give! 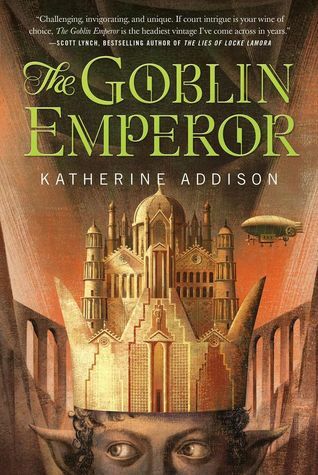 I did enjoy reading The Goblin Emperor and I really liked Maia’s character. But it didn’t become a favorite novel. I just didn’t love it as much as I was expecting. It’s a quiet kind of fantasy, a lot more introspective than action-oriented and filled to the brim with political intrigue. Maia was never groomed to become the emperor and his education is sadly lacking but he rises to the occasion beautifully. He’s a smart guy and never loses the compassion that’s such a big part of him even though he had a gloomy upbringing. He has an inner strength that others gradually recognize and admire, which helps him gain allies along the way. I like how Maia inspires loyalty because of how kind he is and how unusual that kindness is in an emperor. He deserves all the help that he can get so it’s a good thing that there are some people on his side. One thing that I liked about the novel is that it’s a standalone… as much as I love reading fantasy series, it’s refreshing to read a book that is complete on its own. 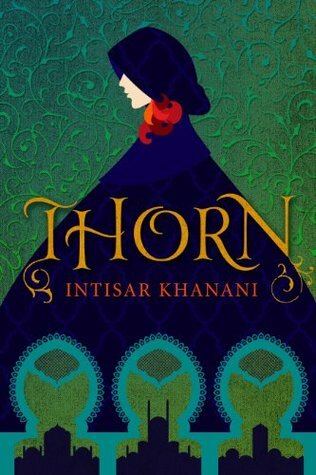 While I believe this story wouldn’t linger in my mind, I did have fun reading it and would recommend the book to readers who like quiet fantasy with a strong dose of politics. I haven’t read a Sharon Shinn novel recently so I picked up Troubled Waters when I was in the mood for some fantasy. I have fond memories of the author’s Samaria books, which is an excellent series about angels. I also remember enjoying the Twelve Houses series although I’m a bit fuzzy on the details since it’s been years since I read them. From what I’ve heard, Troubled Waters is the first in a series but was initially written as a standalone. I liked knowing that I could read Troubled Waters by itself and that I didn’t have to worry about committing to a whole series. It’s there that Zoe realizes she is a coru prime ruled by the elemental sign of water. She must return to the palace, not as an unwilling bride for the king, but a woman with power in her own right. But as Zoe unlocks more of the mysteries of her blood—and the secrets of the royal family — she must decide how to use her great power to rise above the deceptions and intrigue of the royal court. At the start of the novel, Zoe is grieving and mourning the loss of her beloved father. He was a powerful man at court but was exiled by the king for reasons that aren’t really clear to Zoe. They lived simply in a remote village far from the city. Numb with grief, Zoe isn’t even surprised when the king’s right-hand man shows up at their village to whisk her away to the capital, saying that she’s meant to be the king’s fifth wife. At that point, Zoe doesn’t really care what happens with her future but eventually, the numbness wears off and she realizes that she has no intention of being forced to marry someone she doesn’t know. I found Troubled Waters an absorbing read mostly because I liked Zoe as a character. It was very easy to get into her story and read about her adventures – living with the squatters near the river, working as a shopgirl and slowly discovering her powers. I also knew right away that there would be a romance. It was subtly done but I noticed how carefully Zoe kept paying attention to this guy. It’s a really good slow burn romance that’s drawn out throughout the length of the whole book. I enjoyed the conversations (mostly arguments) between these two characters and looked forward to their moments together. I liked the world presented by Troubled Waters, where everyone receives random blessings a few hours after they’re born. Supplicants can also enter temples and draw out blessings whenever they feel like they need guidance. These blessings are based on the elements (air, water, fire, wood and earth). Everyone’s personality and way of life is tied to these elements. Zoe is coru, a woman of blood and water, which she inherits from her mother’s side of the family. As a result, she adapts easily to changes and surprises in her life. But she also gets sweela, which is fire, from her father. I don’t think I’m explaining it well but I found these blessings and elemental characteristics charming. I found Troubled Waters to be a quiet kind of fantasy. Kind of like a smooth and steady ride instead of wild and bumpy. Reading this book was a pleasant experience, it’s the type of book that I enjoy curling up with on a lazy weekend or to help me unwind after a work day. I can sense that Troubled Waters isn’t the kind of book that everyone will enjoy but I have a feeling most epic fantasy readers will probable have fun reading it. Troubled Waters reminded me a bit of my reading experience of House of Shadows by Rachel Neumeier, not because of any similarities in worldbuilding or characters but just in the sense that I found both of them satisfying reads but couldn’t quite pinpoint why they worked for me. 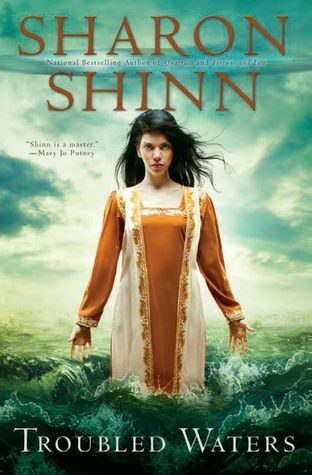 All I can say is that Sharon Shinn is a good storyteller and I enjoy reading her books. A minor quibble that I have with Troubled Waters is that I think the ending should have been extended a bit, it would have been nice to have an epilogue in there. But that’s not a major issue and I enjoyed reading the book overall. I might be tempted to read another Sharon Shinn novel soon. I read both Graceling and Fire by Kristin Cashore when they first came out. That was a few years ago, back when I didn’t have a book blog. I recently reread them for a discussion with my online book club YAckers. I loved rereading both and realized that I have never written a review for Fire. 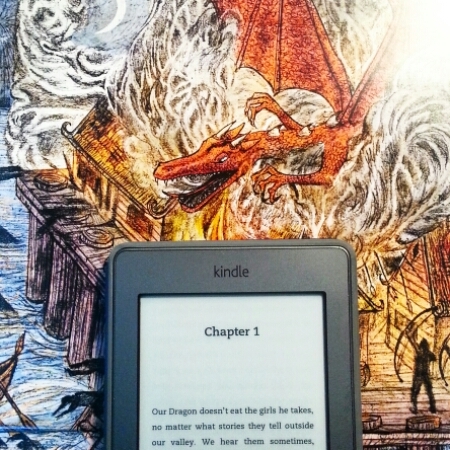 It’s a good thing I refreshed my memory by rereading it recently because that gave me the perfect opportunity to talk about one of my absolute favorite epic fantasy novels. Fire is such an achingly beautiful novel. It is wonderfully written with engaging characters, set in a dazzlingly colorful world. Fire is a human monster, an amazingly beautiful person who can read minds and manipulate people through her powers – either with just the way she looks or by compelling them to say or do things. Having seen what her cruel father Cansrel was able to do with his own monstrous powers, Fire is very cautious with hers. She has no intention of manipulating people and doesn’t even want to be involved in court politics. But the kingdom is on the brink of civil war and Fire has a role to play in all of this. Fire just has everything that I look for in my epic fantasy reads. Great characters, solid worldbuilding, a slow burn romance that I can root for and complex relationships that feel realistic. I cannot recommend it enough. 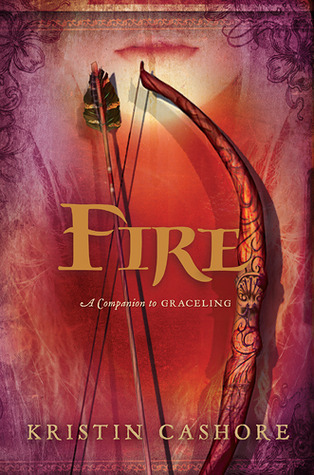 It makes me happy that Fire stood up to a reread and I loved it just as much as when I was first introduced to it. In fact, I had to wait a couple of days for the story to fade from my mind before I could move on to another book. After rereading both Graceling and Fire, I am now craving for a new Kristin Cashore novel. I will be eagerly waiting for news about what she will publish next.